From the author of Reasons to Stay Alive, a love story about a seemingly ordinary 41-year-old London teacher who happens to have a rare condition that causes him to age fifteen times slower than a normal person, and his struggle to live an ordinary life despite having been alive for over 400 years. Grafting such thriller-like elements on to what is otherwise a rollicking time-hopping fantasy may sound convoluted, but the cleverness of How to Stop Time lies in how effortless Haig makes it feel. Of course, you think to yourself, this makes perfect sense: the anagerics (if they existed) would form a secret society ... Haig has been gifted with a rare ability, which is to make the far-fetched – and even ridiculous – seem believable. His books tickle your mind and tug on your heart, and their pages slip by with beguiling ease. Even before Benedict Cumberbatch goes voyaging across the centuries, How to Stop Time will provoke wonder and delight. 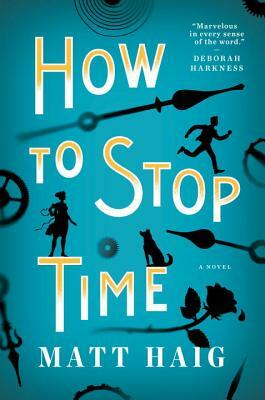 How To Stop Time plays like a meditation on the tick and tock of time and mortality. On the preciousness of every moment and the nightmare of having both too few and too many. There's a conspiracy element thrown in to give the plot a little kick, but it's a minor secondary plot until the book's final third, and serves as an armature to keep the laggier parts of the narrative upright ... suffers when it grows heavy and lingers too long in any one time or place, but in the moments when Haig allows his narrator to flit from moment, recalling spans of decades as if they were a long weekend, then land somewhere for a few paragraphs to describe Paris or New York at instants when they mattered to Tom and his tale, the book can be remarkably beautiful, achingly sad and completely alien all at once. ...part love story and part thriller, though not quite enough of either ... Haig remains a keen-eyed observer of contemporary life and his dialogue has snap and charm. In the past, however, he is on shakier ground; his characters seem to exist less in their historical surroundings than to have pushed their faces through the holes in painted carnival cutouts ... In the end, though, it is Tom himself who most bogs down the narrative. More than once he apologizes for his 'heaviness,' and with good reason. Weary of life, still grieving his dead wife some four centuries after her death, he makes for a frustratingly passive protagonist. What did you think of How to Stop Time?